Laboratory Sieves are widely used for determining the grain size distribution of soils. We are a reputed Laboratory Sieves, Laboratory Test Sieves, Laboratory Sieve Manufacturer, Exporter & Supplier, and offer sieves that are ideal for the application mentioned above. Laboratory Test Sieves, offered by us, are precision-engineered machines that give accurate results, and thus are widely in demand. Our Laboratory Sieves are designed flawlessly by experts at our unit in compliance to the set industry standards. We provide Laboratory Sieves in varying sieve sizes to meet the diverse requirements of the customers. 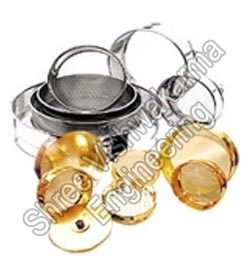 Our Laboratory Sieves are quality-approved as per high quality standards. The Laboratory Sieves are available at the most reasonable rates.